Safari is a book that operates on so many levels and serves so many curiosities. 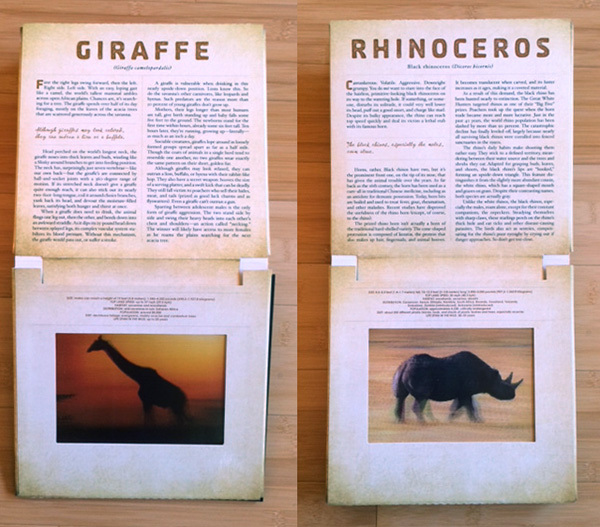 Your first pick-up of the book takes you into its magic — the photicular images of eight African animals running or doing their thing (designed and photographed by Dan Kainen). It’s a total experience for the reader as you control their speed by how fast you turn the previous page. This is a mechanical marvel that uses an old technology called lenticular photography but presents it in a brand new way. This was popularized with the book Gallop but brought to a whole new level in Safari. You can literally spend hours turning the pages and imagine yourself on safari watching these majestic creatures at close range. This alone makes this a book suited for kids as well as adults. The second level is the story of the safari written by Carol Kaufmann describing her guided trip to the northwest corner of Masai Mara, Kenya. Carol vividly chronicles her days, the landscape, and the numerous sightings and encounters. She records much of the dialogue with Massek, her guide and others which helps put you in the seat next to her in the Range Rover. And it is a wild ride. There is no mistaking; she is borrowing a rare glimpse into this majestic and dangerous world. The third level is the description of each of the eight animals photographed. Written with the same voice as her essay, she delivers myriad facts and specs with warmth, humor and empathy. For example, a rhinoceros is described as cantankerous, volatile, aggressive—and downright grumpy! Beneath her storytelling is one more level of info—a list of facts and figures if you considered stowing one of these beasts on your carry-on. This is an amazing and marvelous book—in content, design and execution. You would expect it to be sixty bucks, but it’s not even close! It belongs on every kid’s top shelf and parent’s coffee table.